On this excursion you will visit the most unique temple of the near suburbs. Some visitors see in the Dubrovitsky temple explicit elements of the Gothic style, others find similarities with the architecture in the Baroque style. In any case, you can make independent conclusions. In 1690, Prince Boris Alekseevich Golitsyn laid in Dubrovitsy an unusually beautiful temple, a true architectural masterpiece. A pillar-shaped building, standing on a high stereobate, surrounded by open galleries with fan-shaped staircases. Above the first tier stands a slender octagonal tower, topped with an original openwork dome. 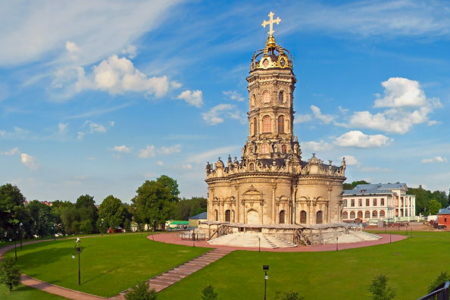 Golitsyn was able to translate such a daring architectural design only because of his closeness to Peter I, who was very interested in the construction of this temple. 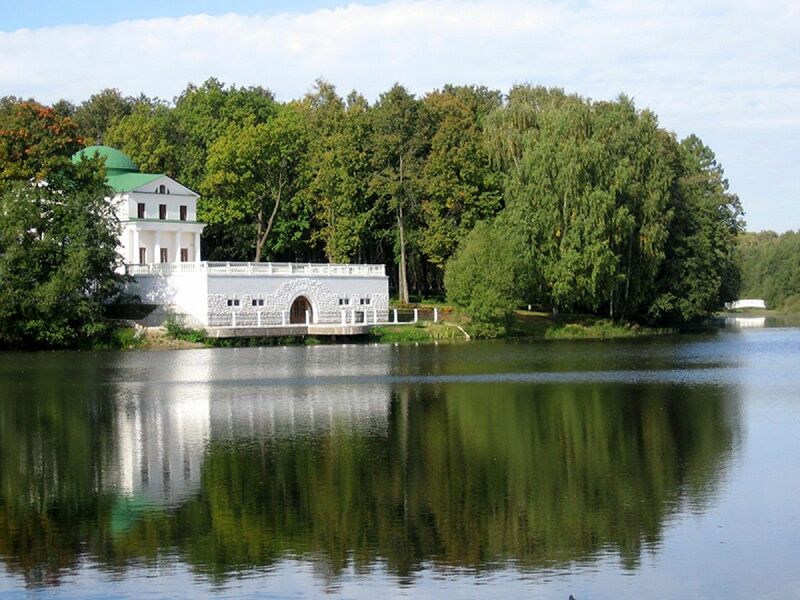 Visiting Dubrovitsy, you will get a real pleasure. An unusually beautiful square in front of the temple, European lawns, paths paved with white stone, and. of course a mound with a viewing platform. 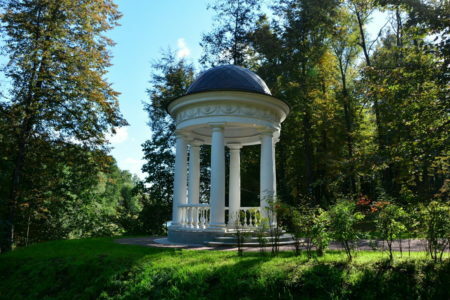 Near the temple is the famous Dubrovitsy manor. In the succession of the owners of the estate, the most famous faces of Russian history are the boyars Morozovs, the princes Golitsyns, the most eminent prince Potemkin-Tavrichesky, the Counts of Dmitriyev – the Mamonovs. 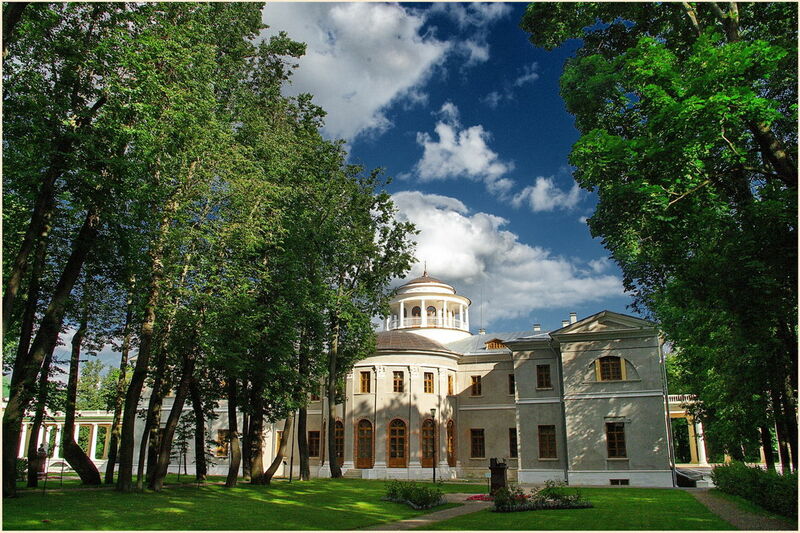 Climbing the steps of the high mound, you can admire the famous “fork” – the confluence of the Desna and Pakhra rivers. It is here that the famous singing field is located – the place of annual song festivals. 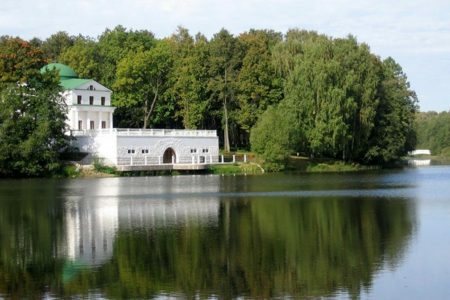 Passing through Podolsk, we will look into Ivanovskoye estate – the estate of Count Arseny Andreyevich Zakrevsky, the most unloved Moscow governor and at the same time the hero of the war of 1812. His wife, the dazzling and ardent beauty Agrafena Fedorovna, was fascinated by Baratynsky, Vyazemsky and Pushkin, who called her “Cleopatra Neva”, “Copper Venus”, and Muscovites Messalina. A ceremonial house-palace, built in classical style, was preserved on the high bank of the Pakhra river, to which the once splendid park descended.